Supplemental examination became available on September 16, 2012, as a result of new section 257 of Title 35, United States Code, which was added by Public Law 112-29, enacted on September 16, 2011, known as the Leahy-Smith America Invents Act (AIA). Supplemental examination provisions of the AIA provide a patent owner with a mechanism to request that the Office consider, reconsider, or correct information believed to be relevant to the patent. The rules of practice in patent cases relating to supplemental examination were promulgated on August 14, 2012, at 77 Fed. Reg. 48828-48853. Unlike ex parte reexamination practice, the information that the patent owner may request to be considered, reconsidered, or corrected in a supplemental examination proceeding is not limited to patents and printed publications. The "information" may include any information that the patent owner believes to be relevant to the patent. For example, the information may include not only a patent or a journal article, but also a sales invoice, or a transcript of an audio or video recording. In addition, the information submitted as part of a request for supplemental examination may involve any ground of patentability, such as, for example, patent eligible subject matter, anticipation, public use or sale, obviousness, written description, enablement, indefiniteness, and double-patenting. 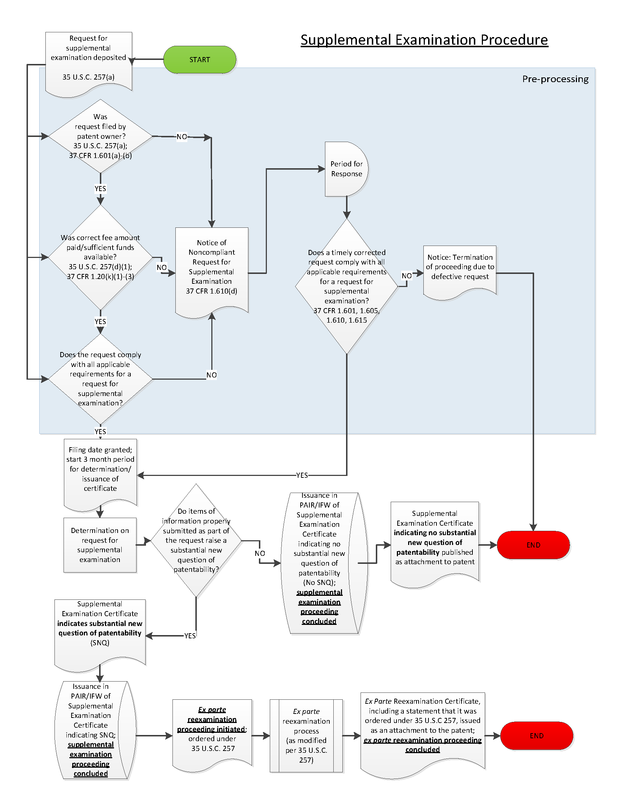 The flowchart below shows the general procedure for a supplemental examination proceeding, and for an ex parte reexamination proceeding initiated/ordered as a result of a supplemental examination proceeding.